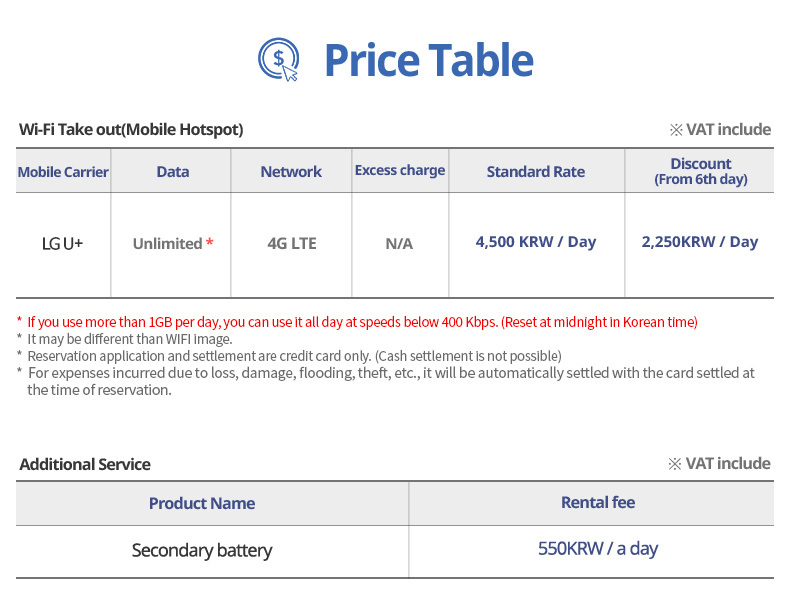 Korea Wi-Fi Mobile Hotspot : Anywhere in Korea, LTE unlimited. * General payment method for your reservation is to pay on arrival. However, it may be subject to change depending on your reservation route. * In the event of lost of a device or damage done during the term of rental, we will be charging additional fees in future. * Arrival and Departure date must be accurate in order for you to pick up and return the device on time. * Rental period should start from your device pick up date until the device returning date. * Please return the device before departure procedures. * Please write your e-mail address correctly as your confirmation of reservation will be sent to your e-mail. I agree. I do not agree. I agree. I do not agree. * In the event of cancellation, you will need to contact us two days before your pick-up date in order to get full amount to be refunded. * Unfortunately, we will not be able to refund the unused credit for early termination. * You agree not to use the internet service for activities that are illegal in Korea. * Reservation to be made at least 2 business days in advance to place an order. * In the event of Cancellation of reservation due to run out of stock, you will get your full rental fee back as well as your deposit. * Once your reservation is confirmed, we will send you a confirmation of reservation to your e-mail. Your confirmation of reservation is necessary when picking up your device. * If you wish to extend your rental period or are not be able to return a device for any reason, please contact us, otherwise we will deactivate the device and additional charges may occur. * Reservation to be made at least 5 business days in advance to place an order. It can be connected with up to 5 devices at the same time. Yes. we provide a device charger. Also it comes with a Wi-Fi device, a pouch, and an instructions. Yes. We always charge a device before we hand it out. 4G smart phone, 3G smart phone, laptop, tablet pc, and etc. It does work with any Wi-Fi enabled devices. Simply switch on a device and enable Wi-Fi from your devices. The coverage is same as a Korean mobile carrier's coverage. Theoretically, it can travel about 50 meters, but it can actually travel around 10 to 15 meters. Yes. It works with any kind of mobile phone that is Wi-Fi enabled, and you can use Kakao Talk and Voice Talk as well. You can get the SIM card with device but not available only SIM card. You can pick up the device at Incheon airport, Gimpo airport, Cheong Ju airport, Gimhae airport, Busan port or main office in Seoul. Please specify how and when picking up and returning methods to arrange it in advance. Once you place an order you can print the reservation complete page and exchange voucher. You need voucher, rental fee and passport. You can cancel your reservation by the confirmation e-mail sent from us, but it can not be canceled once the device is arranged. Just give us a call at 1566-9070 (Open all year round) and let us know how much longer you need the device for. Standard daily rental rates will apply, but there is no extra charge for extending your rental period. 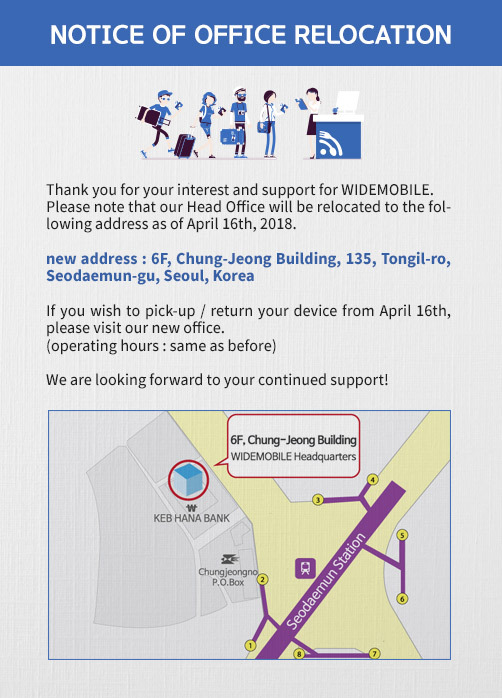 Please note that if you don't return the device without notice the security deposit of 200,000 won automatically charged as of missing. You can get our devices no.7, 1st floor, Incheon International Airport, 24 hours if we keep them in stock. But it is not available to pick up at Gimpo airport, Gimhae airport and Jeju airport with making reservation in advance. Your reservation is safe and secure. This reservation can only be made by overseas issuing credit card. ※ Safe payment through electronic payment provider is used. ※ Wide Mobile protects your personal information. ● If you return earlier than scheduled after your reservation, there is no refund for the usage fee. ●You will now be able to make payments and reservation online in KRW. ●Once the reservation is completed, you can pick up your device without any additional payment process. ●Credit card ONLY. (Cash payment is not available). - After the device is assigned 3~4 days prior to the arrival date, the rental fees will automatically be charged to the registered credit card and the reservation confirmation (voucher) will be sent to your e-mail address. - The rental fees shall be paid in advanced starting from the arrival date and telephone calls, loss and damage charges shall be charged afterwards. - The credit card details inserted shall only be used for the purpose of this service. - The said credit card details is to guarantee the loss/damage of rental device and for the payment of usage.